Refer to images for dimensions. Does your punch collection include lever style punches? 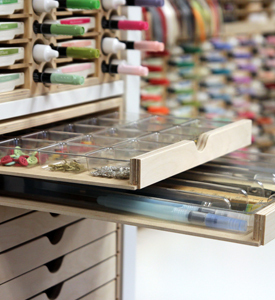 Well, we've got a craft storage solution for you! The Whale-Tail Punch Holder has space for 18 large, 9 medium, and 12 small punches. The horizontal dividers are all removable (except for the glued-in center divider). This will give you additional punch and accessory storage options. You'll even be able to add the provided Spacers to prevent your smaller punches from getting pushed too far back. This product has the option of being wall-mounted too! We’ve also designed a Whale-Tail Punch Holder that will perfectly fit inside of the square IKEA® Kallax shelving openings like a hand in a glove! 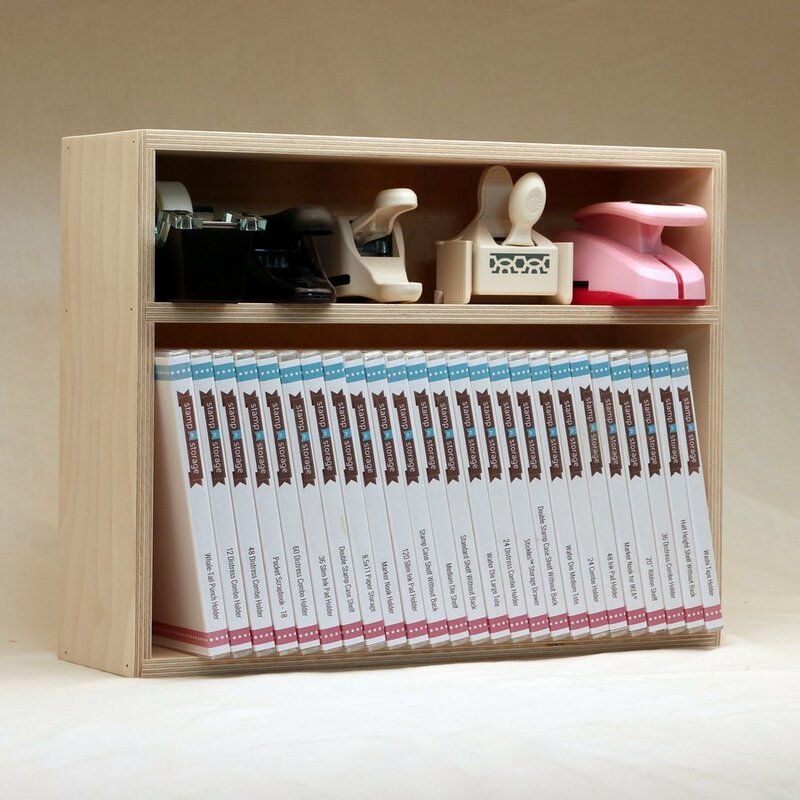 If you’re looking for additional storage options that fit Marvy®, Martha Stewart Crafts®, and other types of punches, check out our Shelf units. Wondering what size this product is? Refer to images for dimensions. 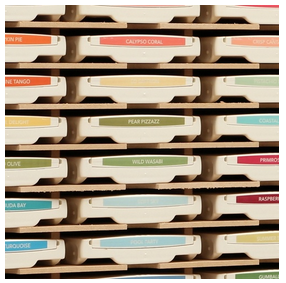 Stamp-n-Storage products are handcrafted in Minnesota and made of Baltic Birch plywood. Products are delivered to you pre-assembled, sanded smooth and display ready! The workmanship on this holder is excellent as is all the products I’ve purchased from them. I was disappointed in this one because it seems it was a bit small, needed to be 1/4-1/2” taller to hold the big punches. Granted they are not Stampin Up punches , but they need a space too. Maybe it was my fault for not looking at the specs closer. I love this unit. The whale tail punches are so oddly shaped they are hard to store and still look nice in your room. This was the perfect solution! It held even more than I thought it would because of the size of some of the punches I had. The unit is well made, sturdy an so smooth when you run your hand along the side. I love this company. I have ordered 5 items so far and will order my 6th item as soon as I get done here. I highly recommend them to anyone. I have purchased things from thins company previously and always been very happy with my purchase. Once again very happy. The whale tail punched are hard to store because they are so large. I had them in a drawer but they took up quite a bit of space. This whale tail punch holder will be perfect to hold all of the punches I have! They think of everything you need. different size spaces and spacers to keep the small ones from hiding in the back of the holder. This fit just perfectly on my work table. There was just enough space for all my punches. Moved them from the shelves I purchased also from you. Made the shelves a holder for my large cutting boards. These punches are very heavy and I had them in four 12x12 plastic cases. It was a challenge each time I wanted to use one. Usually I would have to move all the plastic cases to find the case with the punch that I wanted. The new holder keeps them much more available and I don't have to move multiple cases to find the one I want. The down side is that I can't tell what punch I'm getting unless I pull each of them out to see the pattern on the top of the punch or the cutting area on the bottom. My solution is to load my punches opposite of what's shown in the display and tape the item punched by that punch to the area saying "Stampin Up" on the front of each punch. It's a little time consuming, but only needs to be done once. For the larger circle and square punches, I've punched the smallest one, such as the 1" circle, and have written the size of the bigger circle on it before attaching to the punch. I've done the same with my square punches, etc. The larger winged punches for borders don't fit into the holder at all, but since the holder is so narrow, I have room to place those special punches in front of the case on the shelf. This is my second whale punch holder that I purchased. It fits my whale punches perfectly as they are displayed in my kalex units in plain eye sight. I am much more likely to use them a lot more now.So Glad I came across this company. These units are great, I highly recommend them. I recently purchased one large lock-down and three standard whale punch holders. I have them stacked two high on top of storage cubes in a closet. My goal was to get all punches (have at least 200 SU and CM) in one location with easy access to promote increased use. This holds the SU whale punches, SU border punches, standard CM whale punches, and rectangular CM punches. It does not hold the largest/thickest CM whale punches or thickest square punches (for example geometrical multi-maker). I simply place the larger pieces on top of the shelf. I LOVE the Whale Tail Punch Holder because I can store all my Flat Punches in it. I'm a frugal crafter and I am always needing more Punch Storage. So when I run out of room, I'll be ordering another one. I have close to 125 Punches. Just wish I would have gotten the bigger one, can I stack them one on top of another? For years, I have had my variety of punches in a pile on the floor under my desk. Well this nifty shelf solved ALL of my problems. They are now nicely display because this shelf can accommodate the whale tails, the ones that are flat, AND has Smaller slots for those little punches. It is made SO well and is so sturdy. I love this company. Thank you so much! 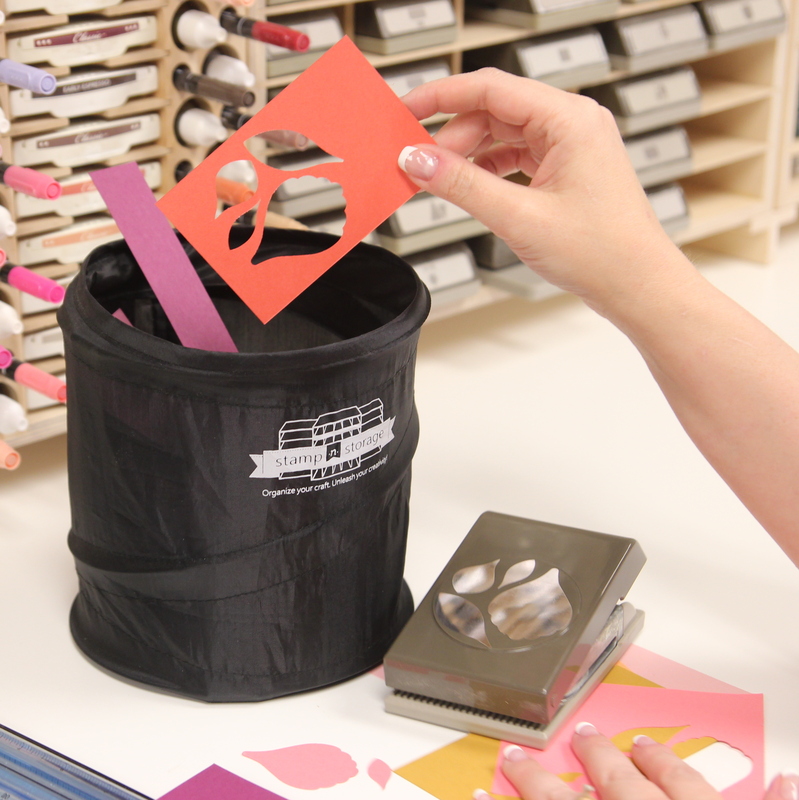 This product is perfect in helping me get my crafts organized. It is well constructed and can hold a lot of punches. Good purchase! I'll use my punches more by having them front and center! This piece is really nice! It is so nice to have everything at your fingertips! This is a fantastic piece to own! I actually could use 1 more! I love these products they are made well and don't take lots of space so I can keep my essentials close by. Just what we needed!! Great products! Love the whale tail punch holder. It makes a drawer storage item become a beautiful wall storage with all of my other IKEA expedit storage items. This company rocks! So glad I found them! This whale tail punch holder works great and not only for storing lever punches, but for most of my other non-lock-down punches such as border punches and corner punches! I love the whale tail punch holder. I use it for punches and the empty spaces I put jars full of embellishments. Everything has a special place and it's right at my fingertips. 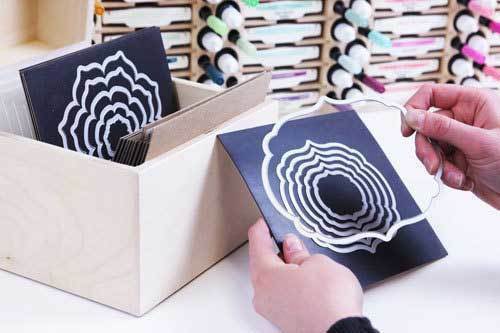 Absolutely the best storage pieces for all paper crafters! Love my whale tail punch holder! Didn't realize I had as many as I do as they were crammed in a box under my craft table. I have purchased many products and am in the process of Brett doing a few custom pieces for my new craft room! Great craftsmanship, great product, and you can finish them to your liking! I can't say enough about how much I love this product and all the other products they make! I love my new Holder. Only thing I would suggest is making them to hold more of the larger one. I wanted to order another but don't need the little slots. Will let other know about your products! I am in the middle of building on a new scrap booking room and setting it up we all of your stuff thanks so much. Love this! My punches were in a basket and I would have to take each one out to find the one I wanted. This is so organized! Now that I have dug out all of my punches and have them all in one place I realize I have punches I forgot I even had! Is so wonderful that they are build for the punches I have, I have had other shelves I used for punch storage, spice wracks, towel bars, but they never fit them so efficiently because they were not made to fit punches, very happy with my purchase! Very strong & sturdy, looks great and is going to be a great addition to my craft space. I am using it for several styles of larger punches that didn't fit into the lock down punch holders I purchased. I love my whale-tail-punch holder! I have so much more room to store more stuff! Very sturdy and holds most of my punches. Won't be long before I will need to order another one. They stack on top of each other nicely. I actually could have used a second holder because I have been stamping for years and use this style a lot. Maybe at a later day I will add to this collection. I received a lock down punch holder and a whale tail punch holder. Just what I need, and great craftsmanship! There was one damaged when I received it, but after calling the company, they quickly sent me another undamaged one, and paid all shipping. In the past I bought a combo holder, and I am very happy with that. 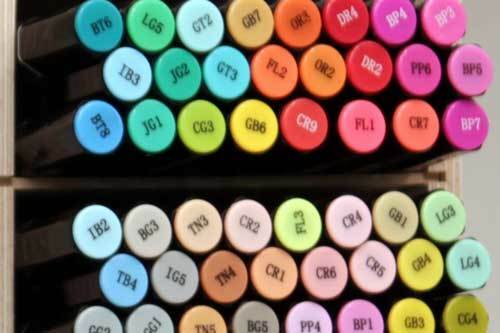 Since my stamp pad & marker stash grew, I will be buying another one next month. Ordered the Whale Tail as well as a Lock Down and love the organization it has created! Ordered 2 lock down cabinets and 1 whale tail. Love these products - were just what I wanted and needed. Beautiful Craftsmanship, precise sturdy and made in the USA what more could you want! This was exactly as I was wanting. They fit perfectly where I wanted them in my craft room. YEA! I love this for cards. A slot for each month. Keeps cards made in 1 place. Love it. This is a great product. I now have a nice place for all of those bulky punches that looks so nice and neat. 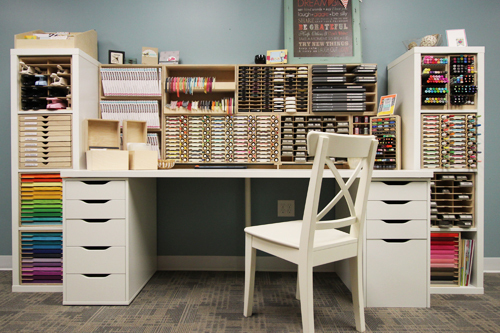 My craft room is coming together wonderfully with the storage pieces that fit in IKEA! I bought a lock down punch holder, which was great, but then got a whale tail punch to finish the job of getting my products organized. It was just the right size! I have never had a punch holder that worked so well. The quality of the product is fantastic . The punches fit great. I will probably need another one soon. This works great for all my different sized punches. I should have ordered sooner!!! Quality is exceptional. As with all their products I've bought, I received a high quality product that was a perfect fit with my IKEA shelving unit! Purchased this size as I felt it would be more accommodating that the other and it is. It is still overpriced for what it is. It's like buying teaching tools-too much for something so simplistic and inexpensive to make. Women getting the shaft. It's okay but should be half of the price at the very least. I wanted a little more tidy look. this is tidy but I wish there was a way to show what they are when they are in the holder. Works just as well as the other punch holder. I love them both, no more shelves for me.. Just these, they are great! I love this - as I do all of the products I have from you. Stampnstorage is the way to go! I really like the whale tail punch holder I ordered. Your products are great for my crafting supplies. I have several products and enjoy them all. Your products have organized me and inspired me to spend more time in my craft room. Love my new punch holder wall shelf! Now I can really get organized! I love this shelf for these old punches but I wish there was a way to 'mark' the shelf with what each punch is because you can't see them. I have punched each one and attached the shape to the back of the punch but I would prefer to be able to mark the shelves. Love it though, well worth the money. Like I said about the whale tail holder they are the best!! Love how neat my room looks now and I don't have them up on the wall yet!! 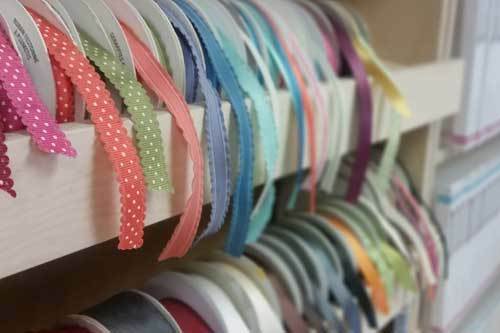 Cool idea how to hang them never dreamed it would be this easy, hubby also liked the idea!! Thank you!! It's the best idea since containers for storage were first thought of. Love the fresh pine smell and smoothness of the outside and the shelves are just right!! Thank you!! I love having all my punches out where I can see them, rather than having them in a drawer. 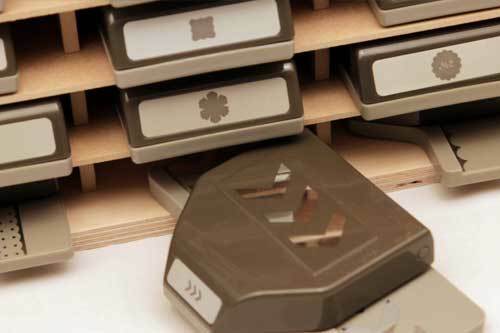 Stamp-n-Storage makes great products. I also have the Combo Holder and the Magnet Cards. Keep up the good work! I have added more punches and I'm glad that this unit matches the first one I bought a couple of years ago. Excellent workmanship. I am so exited about having this new storage unit for my whale tail punches as well as having room for my border punches. My card making supplies are now visible and within reach. The quality of this shelf and dividers is awesome! Love my whale storage! Best item I have purchased on line. Look forward to making future purchases. Best Solution For Whale Tail Punches Ever! I love it; its perfect! I wish I could find a way to identify them without having to pull each one out to see the picture. I had punches everywhere & could never find a way to organize them. This works perfectly! Well built, solid enough to hold the weight. I am so happy to take them out of my drawer. Now I will use them more. I have been wanting this punch storage for awhile and so glad I finally got it. I got the whale tale storage as I have both types of punches and both types fit in very well. It is already full so will either have to think about getting another storage unit or not ordering any more punches (and we know that won't happen)! A quality product and will stand up to everyday use and abuse. I am so glad I finally got this. It is wonderful to have all my punches in view and available to just reach out and get the one I want right away. I used to have all the punches in a bin and had to dig through it to find the one I wanted. Now I organized and just love it. I purchased two whale tail punch holders; one to hold my Stampin Up/EK locking punches which stack nicely and one for my Martha Stewart punches. The holders sure make it easy to get to my punches and I don't have to dig through my plastic bins to find what I'm looking for any longer. I didn't have to wait long; I received them within a few days of my order. Great experience with a great company. Thank you. "LOVE LOVE LOVE IT." Short, sweet and to the point. Thank you, Stamp n Storage. The Whale Tail holder is exactly what I needed to help re-organize my stamp room. Before the "whale tail" was installed, my punches were in boxes on my floor. Now, all punches are within easy reach and neat and orderly. It is so nice to have a holder specifically for the whale tails. Everything fits just like it should. Thank you Stamp N Storage for one great product! I'm so happy I bought this product. The Whale Tail punches fit perfectly. I was using a clear shoe rack, but it got too heavy and broke the bar it was hanging from. This makes for a much cleaner look. I'm delighted with the Whale Tail Punch Holder! I did not receive the correct product. I received the push down punch holder. I also ordered the wall mount and it's not a wall mount. Just got my whale tail punch holder, and I LOVE IT! Very high quality wood construction. Punches fit well. Also bought the Lock down punch holder, ink/marker holder, 48 pen holder, wafer die storage ( sz med), and the stacjed marker holder. I am so glad that I chose these products. They may seem a bit pricey, but the high quality and ruggedness make them worth it. All are the same heighth, making stacking and rearranging easy. I am looking forward to buying more of their products soon. My dear hubby purchased this as a present for my bday. What a surprise! My punches are now hung on the wall as the mounting system is also sold by Stamp n Storage. 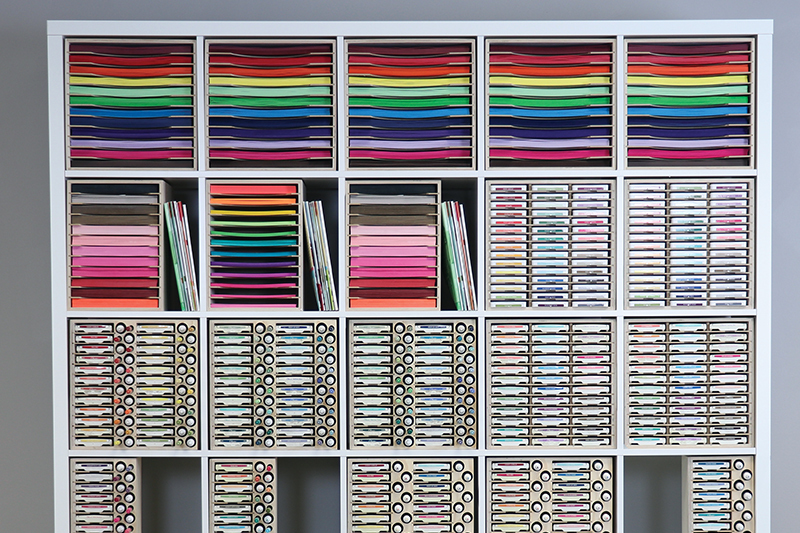 Not only am I organized, but the quality of this product is exceptional! 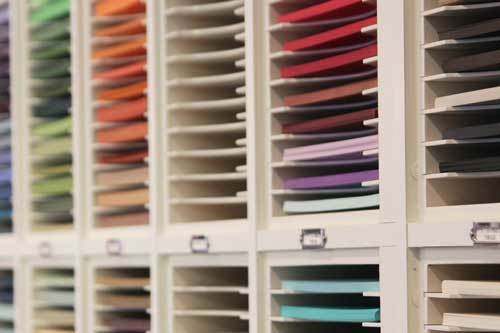 Imagine your space with many different products from Stamp n Storage and you will realize organization does release the creative flow! I have both types of paper punches but not enough for both types of holders. I used this one and it worked for both. I can stack two or more lock down punches in the larger slots. All are easy to take out and put back. Just got this and now have these punches at my fingertips. It sits right next to the lock down punch holder, a set!easy to use,easy to put punches back into! All are just a reach away, not buried under parts of the current project, however did I get by without this for so long. Great craftsmanship. I now have 5 pieces from this company, love 'me all! The shelves need to be a little further apart for the Martha Stewart whale tails. Love this! I have been searching for the right way to store my 'old' punches and this was it! This punch holder holds most of my whale tail punches, and I like the way it accommodates punches of different sizes. Would like it to include a way to identify each punch without removing them from shelf. Even so, it has given me a way to organize and store these bulky punches that are not easy to store. I'd like it better if it were bigger and could accommodate the biggest Marvy punches. The fact that it's unfinished makes it look...well, unfinished. Again, I love my whale tail punch holder. They are easily accessible and organized. Only wish there was some way to tell exactly what punch it is, but wouldn't be without it! 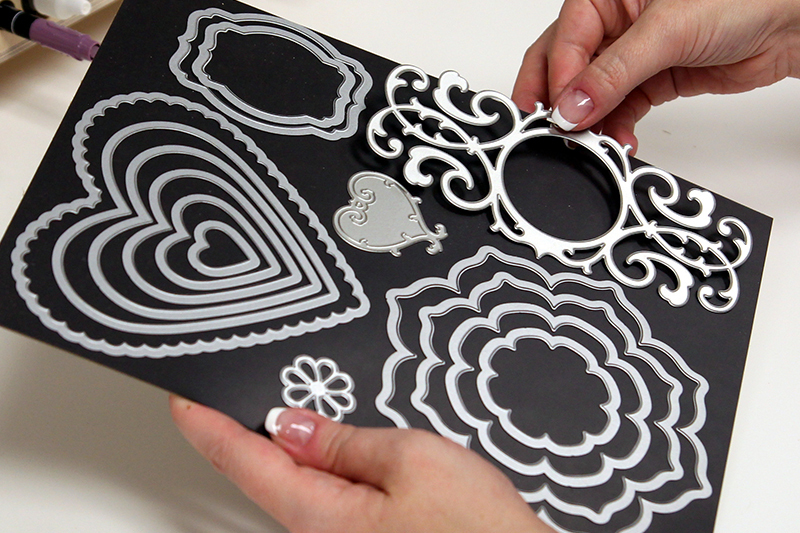 These products are the best for scrappers and cardmakers. The products are well made, solid and the staff was pleasant and helpful...and free shipping.